﻿ Real Madrid 3-0 Eibar. Ronaldo finally breaks his free-kick curse! 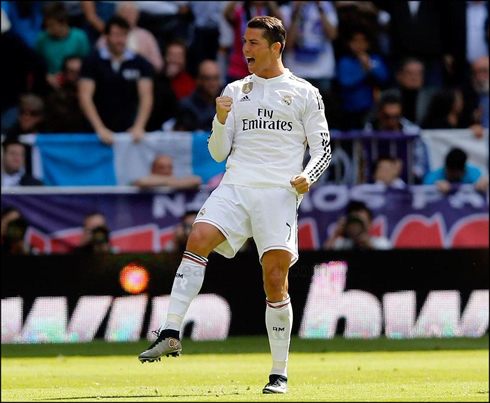 11.04.2015 » Real Madrid 3-0 Eibar. Ronaldo finally breaks his free-kick curse! Real Madrid have done their job again in La Liga, this time after beating Eibar with a 3-0 scoreline and putting some extra pressure on Barcelona. Cristiano Ronaldo led his troops with his first free-kick goal of the season, while Chicharito and Jesé Rodríguez both also scored a goal each to help securing the 3 points. It's been a true "David vs Goliath" match at the Santiago Bernabéu, as Real Madrid hosted and easily disposed of Eibar 3-0, in another La Liga fixture. Even though Madrid were deprived of several of their key players, the visitors never really managed to pose a serious threat and are probably lucky for not having left the Bernabéu with a larger-margin defeat. One of the headlines of this game certainly deserves to go to Cristiano Ronaldo, who finally got to score a goal from a free-kick situation, roughly 1 year after his last successful attempt. The other goalscorers of the afternoon were two players who haven't had much playing time this season: Chicharito and Jesé Rodríguez. Just a few days away from their Champions League quarter-finals clash against Atletico Madrid, Carlo Ancelotti lined up a quite unusual starting eleven for this clash against Eibar. It's true some of his choices ended up being forced due to having some of his players suspended (Kroos and James Rodríguez), but the Italian manager also didn't hesitate in resting others usual starters such as Karim Benzema, Iker Casillas and Dani Carvajal. Cristiano Ronaldo on the other hand, saw his suspension being revoked this last Friday and was given the chance to also contribute in this game. It didn't take him too long to make his presence feel noticed, since it was precisely him who broke the deadlock around the 21st minute of the first half. The Portuguese forward showed he still hasn't lost his touch when it comes to scoring goals from free-kicks and he beat Irureta from a 30-yard strike that put Real Madrid on the driving seat. This was Ronaldo's first free-kick goal of the season, and his first since April 29 of 2014. Back in that day, he beat Bayern Munich's Manuel Neuer in the Champions League semi-finals second leg clash. That first goal from Ronaldo allowed Real Madrid to get more comfortable in the game and it was without much surprise that the Merengues extended their lead just 10 minutes later. It all happened in the 31st minute of the first half, when Arbeloa decided to support the attack down the right wing and put in a perfect cross into the near post. Javier Hernández was waiting for it and didn't miss the opportunity to bury his 4th league goal this season. Chicharito, who is on loan from Manchester United since last summer, keeps trying to prove his value and make the most out of every chance he gets in Madrid. The final score would only be set later in the second half, in a play where Jesé Rodríguez showed off all the talent that has made him such a promising player when he was coming through Real Madrid's youth ranks. The 22-year old took on a defender as he ran into the box, got past him in speed and then struck the ball low and hard into the far post. Great goal from the former Canterano, his 3rd of the season for Real Madrid. And now that Ronaldo has finally managed to break his free-kick curse this season, perhaps it's also a good time for Real Madrid to beat their demons and get the best out of a tie against Atletico Madrid. The two teams will lock horns this Tuesday night, for the first leg of the UEFA Champions League quarter-finals. Attackers: Cristiano Ronaldo, Jesé, Javier Hernandez. Cristiano Ronaldo next game will be for the UEFA Champions League against Atletico Madrid, on the 14th of April of 2015. You can watch Juventus live stream, Atletico Madrid vs Real Madrid, Sevilla vs Barça, Man United vs Manchester City, QPR vs Chelsea, and Stuttgart vs Werder Bremen, all matches provided from our soccer live game pages.